I will tell anyone who will listen to me about how they need to incorporate broths into their diet. The benefits of incorporating collagen and bone broths are endless and powerful. So great is my passion for this superfood, that I wanted to share with you the Top 10 Healing Benefits of Bone Broth. Cultures from all around the world have recognized the healing properties of bone broth, including our own. Order a dish from a popular restaurant and there’s a great possibility your meal was contrived using some type of homemade broth. And while your mother may have served you a bowl of chicken noodle soup when you were feeling under the weather, she probably didn’t tell you why. No, its not the noodles or the chicken, or even just the vegetables. It is the collagen and the plethora of amino acids and minerals in the broth that help to strengthen the immune system and ward off colds and viruses. Broths’ humble beginnings lie with our hunter and gatherer ancestors. Out of necessity and scarcity of food, hunters and gatherers had to use every part of the animal to help stretch meals further, whence boiling the bones began. Broths are now, and have been for some time, widely popular in all different cultures around the world. It is included in many different types of Asian cuisines. Chinese cultures offer a light soup with vegetables and herbs as part of a meal to help with digestion and help to cleanse the palate. South American cultures have recognized it's healing benefits and even the Caribbean serve a broth known for it's medicinal properties, called "cow foot soup." The Jewish culture has long dubbed chicken soup as the Jewish Penicillin due to its ability to ward off illness. 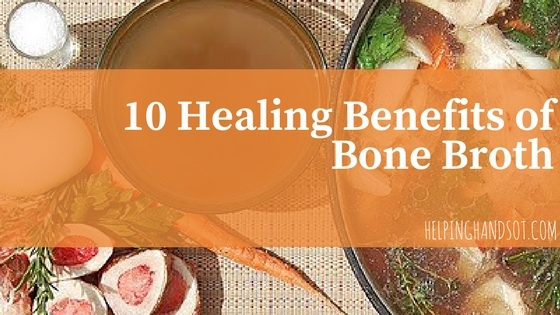 So what exactly is bone broth and what make it so healing? Bone broth is made by simmering healthy animal bones and connective tissues with herbs, vegetables and something acidic, over low heat for an extended period of time (24 hours or longer.) The extended heating time, combined with the acidity, helps to extract collagen and all the vitamins and minerals stored within the bones, cartilage and marrow for a more nutritional broth. The broth that comes as a result can be used in soups or sipped solo in a mug. With bone broth gaining widespread popularity as the newest health trend, it is now well-known as a stand alone dish itself. People sip warm broths from a mug, with or without a meal, and many pop up broth stands are becoming popular, especially in New York City. The short answer on why it is so healing is collagen. Most people only recognize the term as a popular ingredient in many anti-aging creams and lotions. But collagen is the most abundant protein in our bodies. It is found in muscles, bones, skin, blood vessels, digestive system and tendons. It’s what helps give our skin strength and elasticity, along with replacing dead skin cells. After the age of 25, our bodies collagen supplies begin to diminish slowly. We can thank this process for the outward signs of aging such as wrinkles and aching joints. This is why it is so important to ingest collagen (or gelatin) in our diets as we age; to replenish what is being lost. The great thing about making homemade bone broth is that it is easy and affordable. You can save the bones or carcass of any meat source and store them in a freezer-friendly bag for when you're ready to make broth. While any type of bones will do, joints that have numerous ligaments and tendons such as knuckles and feet tend to yield the greatest amount of gelatin, the thick, gooey substance that surfaces to the top of a good broth. When selecting bones to make broth, it is important to only use bones from organic, grass-fed animals. Since you will be extracting vitamins and minerals from the bones, you want to make sure you're using a healthy source. Also be sure to add an acid of some sort (apple cider vinegar or lemon) to help with the extraction of nutrients from the bones. If you don't have time or patience for making your own broth, I highly recommend Kettle & Fires Bone Broth. Their product is known to be gelatinous and made from all organic & grass-fed animals. They also have small drinkable and pack-able broths to take with you for sipping on the go. You can purchase their products at a 10% discount at link above by using the code helpinghands10 at checkout. Isn't all Broth Created Equal? Conventional store bought broth doesn't even compare with homemade organic bone broth. Firstly, the process for making store bought broth is totally different than the slow simmering process that allows for nutrient extraction and build up of gelatin. Therefore, broths found in the supermarket contain little to no gelatin. Secondly, most broths found in the grocery store do not use bones from organic animals. Thirdly, many broths have harmful ingredients added such as MSG. Since natural collagen supplies begin to diminish after the age of 25, you can visibly see (and feel) the negative effects of slowing collagen supplies (i.e. wrinkles, sagging skin, aching joints and bones.) Collagen is what helps to repair skin and gives it firmness and elasticity (the opposite of sagging skin). This is why it is so popular as an ingredient in anti-aging beauty products. Interestingly, though, collagen isn’t easily absorbed and assimilated through the skin. A double-blind, placebo-controlled study investigating the anti-aging properties of collagen, found that 2.5–5 grams of collagen hydrolysate, used among women aged 35–55 once daily for eight weeks, significantly improved skin elasticity, skin moisture, transepidermal water loss (dryness) and skin roughness. First and foremost, bone broth is an abundant (and easy-to-digest) source of several minerals and essential amino acids that can be difficult to obtain through diet. Here are a few: collagen, gelatin, proline, glycine, L-glutamine, Glycosaminoglycans, bone marrow and many minerals such as calcium, magnesium, copper, iron, phosphorus, potassium and zinc. Chris Kresser gives a breakdown here of each essential amino acids role within the body. One study, published in the medicine journal Chest, evaluated a traditional chicken soup's ability to inhibit the inflammatory response and clear up symptoms of upper respiratory infections. The study concluded that chicken soup may contain a number of substances with beneficial medicinal activity and when ingested during a cold or flu, it can help decrease respiratory symptoms. Two essential components of the collagen from bone broth are the amino acids glycine and proline, which both act as powerful anti-inflammatories within the body. Collagen, naturally occurring in good bone broth, supports healthy hair, skin and nails. You may have seen many anti-aging facial creams on the shelf of the supermarket contain the super-ingredient collagen. That is because collagen is what keeps the skin elastic, looking healthy, firm and without wrinkles. As we age, our collagen levels decline so it is important to keep it in our diet regularly. The gelatin in bone broths helps to line and heal the mucosal lining of the intestines. Also, glycine stimulates stomach acid production, which acts as a powerful digestive aide. These are both reasons why bone broth is one of the top recommended foods for those suffering from leaky gut syndrome, diverticulitis or those who follow a specific gut healing protocol called GAPS diet. Since bone broth is naturally high in protein and low in sugar and calories, it truly makes the perfect food for someone with diabetes. Even better, it has also proven in labs to act as a buffer for carbohydrate consumption at increasing blood sugar levels. The amino acid glycine, helps control how much glucose is produced by the liver, which helps balance blood sugar levels. Another study showed that glycine helps to mitigate the effects of dietary fructose consumption. Two components of bone broth are glucosamine and chondroitin sulfate, which are well known dietary supplements for maintaining healthy joints and cartilages and combating symptoms of arthritis. One double-blind study found that taking glucosamine plus chondroitin sulfate from cartilage was more effective at treating arthritic pain than taking it in pill form but both groups studied (ingesting glucosamine and chondrotin sulfate directly from cartilage vs extracted from pill form) demonstrated at least a 50% decrease in pain and arthritic symptoms. Bone broth also contains hyaluronic acid, a very common treatment method for joint pain from to Osteoarthritis. Since glycine acts an inhibitory neutotransmitter, it can decrease anxiety and help you to feel calm and ready for sleep. One study reported improved sleep quality after ingestion of 3 grams of glycine before bedtime. Enjoying bone broth during pregnancy will ensure that you and your growing child reap the amazing benefits that nourish bones, teeth, skin, hair and digestion. Since growing babies can be taxing work on the mothers skeletal body and system, the extra nutritional support from bone broth will only support and strengthen joints, bones and cartilage. As a bonus, bone broth has been known to decrease nausea and morning sickness associated with pregnancy. Since it is full of electrolytes and collagen protein, it is something easy (and healthy) to sip on when keeping food down is difficult or unappetizing. Bone broth is one of the top recommended foods for increasing fertility. We already learned how beneficial bone broth is for healing the digestive track. Well, did you also know that a healthy gut is the number one starting point for increasing hormonal health? Bones, Broth, Bliss: Bone Broth Evolves From Prehistoric Food to Paleo Drink. New York Times. Julia Moskin, Jan 6 2015. Chicken Soup Really Is ‘Jewish Penicillin’ For Your Cold. Mom Was Right. The Huffington Post. Kate Bratskeir. December 2014. What is Collagen? Dr. Axe. The Structure of Collagen. Rich & Crick. Medical Research Council Unit for Study of Molecular Structure of Biological Systems. Cavendish Labratory. Cambridge University. Nov. 1955. Oral supplementation of specific collagen peptides has beneficial effects on human skin physiology: a double-blind, placebo-controlled study. Proksch E1, Segger D, Degwert J, Schunck M, Zague V, Oesser S. Skin Pharmacol Physiol. 2014;27(1):47-55. doi: 10.1159/000351376. Epub 2013 Aug 14.